Before I go any further, a quick interruption regarding our schedule this week. We will be off our regular Friday schedule to prepare for Gypsy Picnic, which will feature us and 29 other food trailers on Saturday, November 6th from 11AM-8PM. I apologize for any inconvenience this may cause! The most frequent question I get while working the food truck is "why did you do it?" Why did you leave a high paying job as an attorney to jump into a notoriously difficult to succeed industry? The simple, one word answer? Fear. You see, nothing scares me more than the simple fact that I only have the opportunity to live this one life. The fear of starting this new, risky venture was heavily outweighed by the fear of always wondering "what if." I dreaded the notion that five years down the road I would be sitting in an office asking myself "what if you had just followed through on that food truck venture?" 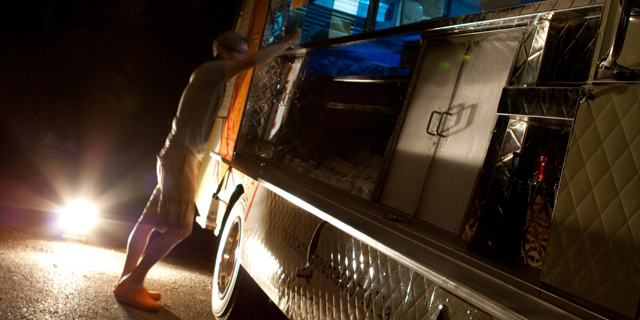 I studied food trucks like it was my job for over a year; it was time to make it my job. A small sculpture from the Successories store sits on my nightstand at my parent's home. My father gave it to me as a Christmas gift when I was ten years old. The sculpture is of a soccer ball and below it it reads "you miss 100% of the shots you never take." Or something to that effect; don't quote me verbatim. Yes, these motivational quotes err on the cheesy side. I'm not going to argue that point. Bottom line, though, is they are true. For some reason, that quote has been stuck in my head like a tongue on ice for the past 18 years and it served (and continues to serve) as a driving force for me on this project. Life is too short to ask "what if?" I would rather just remove the question all together. Life can pass you by in a blink of an eye. Sometimes we get so caught up in our daily routine that we forget about that. Don't. After all, you only live once.